What Are Executive Rehabilitation Programs? See if the program offers the kind of features you’re looking for, such as computer access, meeting rooms, private bedrooms and gourmet meals. Find a customized program, rather than a single program for all clients. Make sure you’ll have access to doctors, psychiatrists and other staff who have experience treating addiction. Verify that the program can treat any other mental health issues or addictions you may have, such as depression, anxiety, gambling or overeating. Learn what kind of aftercare or follow-up care the program offers post-rehab. An executive recovery center offers therapy that allows executives to progress through their recovery from drug addiction while creating a minimal impact on their professional and personal lives. Private executive rehab programs are specially designed to meet the needs of CEOs and executives. Most of these recovery programs include the following features. Confidentiality is required of all treatment programs, so the only people who will know about your treatment are you, your doctors and whoever else you choose to share your experience with. Executive treatment centers also have workspaces, meeting rooms and access to Internet and phones. These features allow you to continue to operate your business while working through the treatment program. Executive programs tend to have spa treatments, yoga and meditation classes, private trainers, professional chefs, and larger, more private rooms. These programs often have a lower number of patients. A lower staff-to-patient ratio costs more than standard treatment, but it offers the most personalized care. Your doctors will help you find what works for you, rather than running you through a standard treatment protocol. 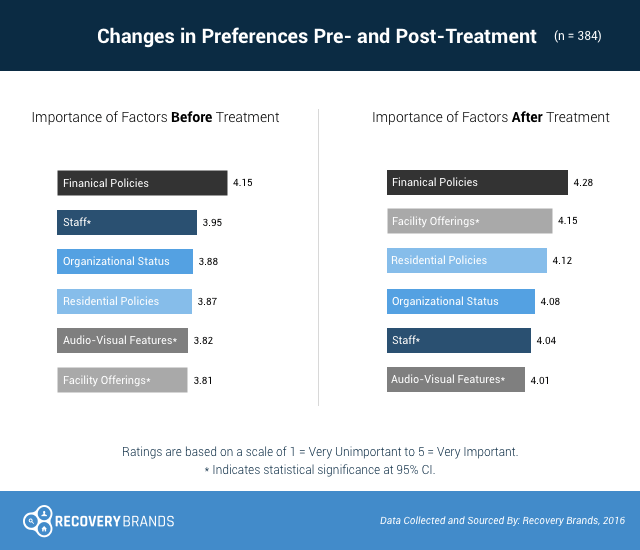 According to a 2016 Recovery Brands survey, people entering treatment prioritize different program factors than people leaving treatment. Those leaving treatment ranked offerings such as food, activities, and comforts significantly higher, meaning that they may have underestimated these when entering treatment. Consider all aspects of a program when making your decision. Executive rehabilitation centers may involve either inpatient (also known as residential) or outpatient treatment. Inpatient treatment tends to be better for more extreme cases of abuse or dependence, while outpatient treatment may be more effective for earlier stages of abuse. 30-day: Attend group and individual therapy sessions while living in an entirely sober setting. 60-day: Extended version of the 30-day plan, developing a better connection with your doctors and recovering peers. 90-day: Stay in a sober environment for longer, providing more time to enhance your abstinence skills and develop coping strategies. Inpatient treatment: This type of treatment is immersive. It provides an escape from the environment that led to the abuse. Many people find inpatient treatment very beneficial in their recovery, and executive inpatient programs are some of the most luxurious and comfortable. Outpatient treatment: This type of treatment allows you to work on your recovery from home. It features involved, but not constant, care. You will still attend regular group and individual therapy, but you will not be living in an entirely sober environment. Intensive outpatient programs. These programs are a more involved option for those who want to live at home during treatment. Their main focus is relapse prevention, and you will regularly attend group meetings, individual and group therapy and addiction education. Sobriety is monitored during treatment, and you will have the luxury of 24-hour crisis coverage. Who Answers? to speak with a treatment specialist about private executive rehab options for you or your loved one. Detox from alcohol or drugs. Group and/or individual psychotherapy with a substance abuse counselor. Follow-up care or aftercare for you so that you can continue to receive support after you leave. Detoxification is generally the first phase of a recovery program. Detoxification is generally the first phase of a recovery program. This phase involves the cessation of drug use, which can produce a range of unpleasant symptoms as the body withdraws from the influence of drugs and/or alcohol. CEO recovery facilities use a variety of methods to ensure the person is able to withdraw safely and as comfortably as possible during this process. Typically, detox involves a doctor that specializes in safe detoxification. The therapeutic phase of drug recovery can begin after detoxification and may involve group or individual sessions. The primary purpose of therapy is to determine the psychological reasons for a person’s drug use. Cognitive behavioral therapy – CBT focuses on identifying and correcting distorted ways of thinking that can lead to substance abuse or relapse. Dialectical behavior therapy – A form of cognitive behavioral therapy where you work with the therapist on regulating your emotions and learning skills to deal with cravings, such as mindfulness and establishing personal boundaries. Motivational interviewing – The therapist helps you overcome any resistance you have toward treatment and identifying reasons you’d like to quit using drugs or alcohol. Make sure the program employs a staff of highly qualified doctors and therapists with experience treating addiction. While most programs will abide by particular accreditation and certification requirements, it is always better to make sure the program that you are considering offers quality care and treatment. When someone suffers from both a mental health and substance abuse disorder, it is known as dual diagnosis or co-occurring disorders and requires a special treatment program. Many executive rehabilitation centers have experience with dual diagnosis. But it’s important to check that the program has experience treating co-occurring disorders, particularly any issues you are struggling with. The recovery process includes transition and aftercare services after the formal rehabilitation period ends. Regular therapy sessions with a counselor. Aftercare is critical in preventing relapse, so make sure the executive recovery center will provide you with the additional communication and support needed to maintain recovery. We are available at 1-888-319-2606 Who Answers? 24 hours a day if you need help finding the best program for you.